Today we did a loop from and back to Andover taking in many quiet Hampshire lanes with old villages full of thatched houses. Weather was sunny and warm up to about 21C with a brisk NW breeze. We headed out of Andover on lanes to the north via Charlton and up Charlton down. Then down the valley of the Bourne Rivulet a currently dry tributary of the Test. We stopped for coffee at a Pub at St Mary Bourne Village. Then on down to the Test with a good tailwind. We took a loop on byroads round to Longparish and came across a Ford Sam knew of on a side road with an adjacent footbridge. 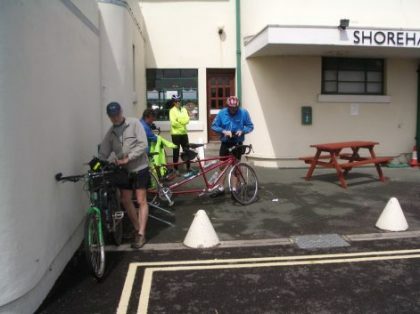 All of us thought it was too deep to cycle except Phil and Mary who decided to give it a go and provided us with our mid-morning entertainment. Momentum soon evaporated in water 2 foot deep and they had to wade across. A couple of the many pictures I took are below. We continued on a scenic byroad via Longstock to stop for lunch at Stockbridge where Phil and Mary laid their socks out to dry in the sun. After lunch we continued south on byroads via Hougton and then a little lane Sam told us was known as puncture alley. I duly obliged by gaining the only puncture of the day. The others were grateful for a post lunch snooze in the sun. We continued down to Mottisfont 6 miles NW of Romsey and then north on more lanes and some climbing to Broughton where we stopped at the Greyhound Inn for Tea. Then back to Andover on lanes near Middle Wallop airfield with gliders swooping in to land. 52 miles for the day. 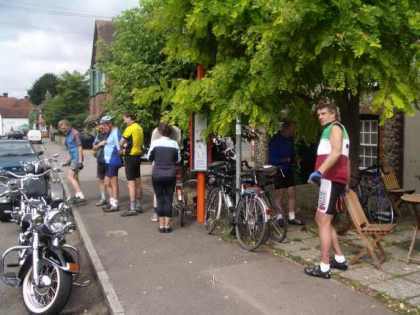 7 of us met at Chichester Cross to ride over to Andover where we will stay while riding in the Test Valley region. Myself (Edwin) John, Sam, Jeff, Phil and Mary and new member David Rang. Weather was variable with warm sunshine and occasional showers most of which we avoided. John led us via Funtington, Compton and Charlton to stop for elevenses at the Queen Elizabeth Country Park. 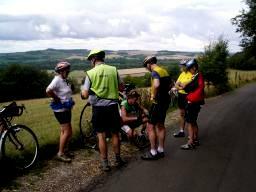 Then over the climb to HMS Mercury and as we started the descent to Warnford the first puncture of the day. Sam's rear tyre pumped to 160psi went down with a loud bang. After this was fixed my rear tyre went down 1/4 mile further on. After climbing Wheely Down we stopped for lunch at a Pub a few miles down the road. Not long after we arrived Sam's Bike parked against the Pub wall emitted a loud hiss as his rear tyre went down. We continued taking lanes via Cheriton and then a very quiet byroad near Itchen Stoke with a ford to ride through. We bypassed Winchester to the North via Kings Worthy and more quiet lanes with a stop at the village shop at Barton Stacey. Then on via wherwell to Andover and our Hotel for 2 nights. Unfortunately the last evening ride of the season was completely washed out. Rain which started in the early afternoon had developed into a serious downpour by the evening, and then got progressively worse as the night wore on. 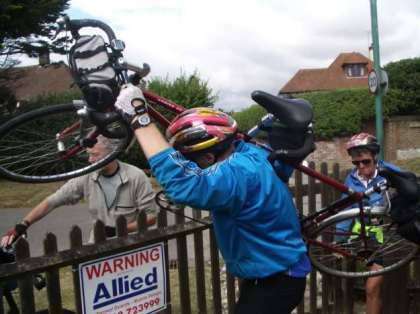 Any prospective riders had sensibly decided not to turn out. Rather less sensibly, the rides leader went down to the start point "just to check", and got drenched for his trouble. Yes, I admit, it was me.